A simple guideline for students and teachers. While her children were young Ms. Frank became a volunteer fundraiser, organizing events for various non-profit organizations around the Metropolitan New York area. Past board service includes The Montclair Art Museum, Whole Theater Company, The Drumthwacket Foundation, The NJ State Council on the Arts and The NJ Cultural Trust. She has also served on the Board of Trustees of the SC Coastal Conservation League and the Parent's Council of the College of Charleston, Bloomfield College (Bloomfield NJ), The Montclair Film Festival (NJ) and The SC Historical Society. Her first novel, SULLIVANS ISLAND (Berkley Publishing 2000) debuted on the NY Times list at number nine and went back to press over twenty five times, has well over one million copies in print and can be found in ten foreign languages. Her subsequent novels PLANTATION (Berkley 2002), ISLE OF PALMS (Berkley 2003), SHEM CREEK (Berkley 2004), PAWLEYS ISLAND (Berkley 2005), FULL OF GRACE (Wm. Morrow 2006), BULLS ISLAND (Wm. Morrow 2007), THE CHRISTMAS PEARL and LAND OF MANGO SUNSETS (Wm. Morrow 2008), LOWCOUNTRY SUMMER (Wm. Morrow 2009), RETURN TO SULLIVANS ISLAND (Wm. Morrow 2010), FOLLY BEACH (Wm. Morrow 2011), PORCH LIGHTS (Wm. Morrow 2012), THE LAST ORIGINAL WIFE (Wm. Morrow 2013), THE HURRICANE SISTERS (Wm. Morrow 2014), ALL THE SINGLE LADIES (Wm. Morrow 2015), ALL SUMMER LONG (Wm. Morrow 2016) and SAME BEACH, NEXT YEAR (Wm. Morrow 2017) were all NY Times bestsellers and may also be found in various foreign languages. Ms. Frank's latest novel, BY INVITATION ONLY, will be released on May 15, 2018. She is the recipient of an Honorary Doctorate of Humane Letters from The College of Charleston, a Doctorate of Fine Arts from Bloomfield College and an Honorary Doctorate of Humane Letters from the Charleston School of Law. 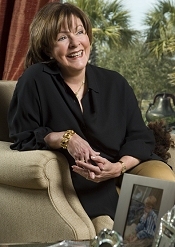 In 2015, she was inducted into the South Carolina Academy of authors and has been honored many times for her work raising awareness about domestic violence and for her community service. Ms. Frank is an avid cook, enjoys fly fishing, reading and travel and is a frequent speaker on the creative process for students of all ages. She divides her time between the Lowcountry of South Carolina and New Jersey. For more information please contact Suzanne Gluck at William Morris Endeavor at 212-903-1169 or sgluck@wmeentertainment.com.